The reverse shoulder replacement was specifically designed for a problem called rotator cuff tear arthropathy. Rotator cuff tear arthropathy is a problem that occurs when a patient has both shoulder arthritis and a rotator cuff tear. The rotator cuff is the group of tendons and muscles that surround the shoulder joint. These muscles and tendons are important in performing shoulder tasks (such as lifting your arm overhead), and keeping the ball of the ball-and-socket shoulder joint centered. When the rotator cuff is torn, the shoulder can wear out, leading to shoulder arthritis. The reason that the reverse shoulder replacement was developed is due to the fact that traditional surgical options for shoulder arthritis do not work well when patients also have a rotator cuff tear. In these patients, total shoulder replacements often do not work. 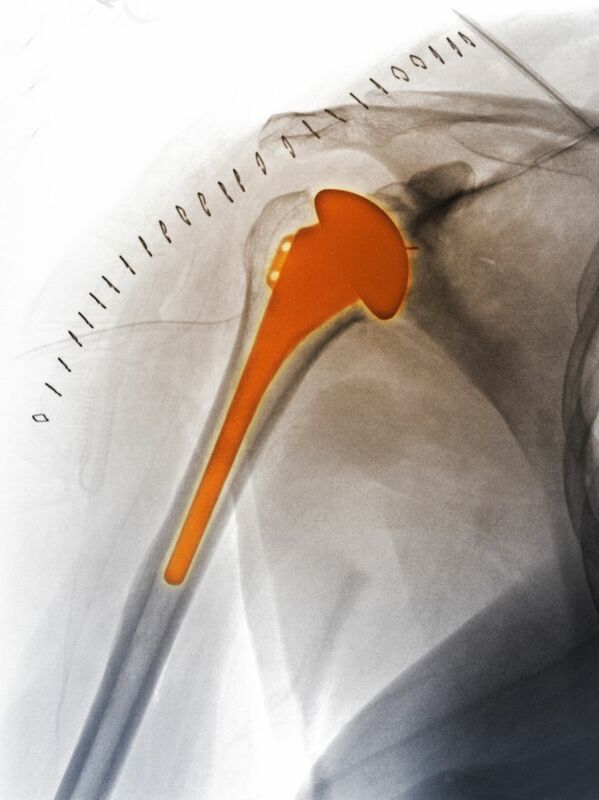 In a traditional shoulder replacement, the ball of the top of the arm bone (the humerus) is replaced with a metal ball. The socket of the shoulder blade (scapula), is replaced with a plastic socket. In patients who have this total shoulder replacement and also have a torn rotator cuff, the socket of the implant is prone to loosening. The absence of a rotator cuff causes the implant to move abnormally, and cause unusual forces on the socket. Reverse shoulder replacements can also be used for people who have severe fractures around the shoulder joint. Fractures that involve the shoulder are sometimes in a location that makes restoration of normal function of the joint a difficult prospect. This is particularly true in people with osteoporosis. For these individuals, trying to restore normal shoulder function can be difficult. The reverse shoulder replacement is an option that makes restoration of shoulder mechanics easier to perform. As mentioned, a traditional shoulder replacement uses a metal ball on the top of the arm bone, and a plastic socket on the shoulder blade. This is similar to how our body is designed with a ball-and-socket shoulder joint. The reverse shoulder replacement uses a ball-and-socket joint as well, but the ball is placed on the shoulder blade, and the socket is placed on top of the arm bone. This is the reverse of our normal anatomy, and thus the name "reverse shoulder replacement." The reason to perform a reverse shoulder replacement is to improve the mechanical advantage of the muscles that surround the shoulder. Why Create a 'Backwards' Shoulder? The reverse shoulder replacement is designed for patients who do not have a functioning rotator cuff, and therefore do not have "normal" shoulder anatomy. Therefore, the reverse shoulder replacement is a good option for taking care of this complicated problem. A reverse shoulder replacement is designed to make the deltoid muscle, the large shoulder muscle, more efficient. In patients with rotator cuff tear arthropathy, the rotator cuff does not work normally, and the deltoid can help make up for this deficiency. By reversing the ball and the socket, the deltoid muscle becomes more able to lift the arm up overhead, and compensate for the torn rotator cuff. Reverse shoulder replacements have been used for more than a decade in Europe, but have only been used in the United States since 2004 when they became FDA approved. While there is very promising data on use of these implants, it is still considered a relatively new design, and more investigation is needed. Leading shoulder surgeons have called the reverse shoulder replacement procedure a "high-risk, high-reward" option for patients with a rotator cuff tear arthropathy. Recent studies have found a complication rate of 25 to 50% associated with this surgery. Complications can include loosening of the implants, instability or dislocation of the ball from the socket, and persistent pain. Is It The Right Option? Patients interested in a reverse shoulder replacement must have severe shoulder arthritis, and a chronic rotator cuff tear. Patients who do not have this combination of conditions can usually undergo other surgical procedures to address their problem. Other factors that influence the decision to perform a reverse shoulder replacement include the function of the deltoid muscle (that must be working well), the age of the patient, and the functional demands of the patient. In general, reverse shoulder replacements are designed for patients with limited activity demands. Patients interested in having this procedure should discuss all of their options with their orthopedic surgeons. Certainly a reverse shoulder replacement should only be performed if simpler, non-operative treatments have failed to alleviate symptoms. Patients should ask their doctors about his or her experience with this procedure, as it is still a relatively new surgical technique. A reverse shoulder replacement is a treatment option for people with severely damaged shoulder joints. Reverse shoulder replacements can be used for people with damage to both the rotator cuff and the cartilage of the shoulder joint. In addition, sometimes a reverse shoulder replacement is used for people who have significant fractures of the bones around the shoulder joint. Because of the mechanics of the shoulder, the reverse shoulder replacement allows for upper extremity function, even when some of the structures around the shoulder have been irreversibly damaged. Ecklund KJ, et al. "Rotator Cuff Tear Arthropathy" J. Am. Acad. Ortho. Surg., June 2007; 15: 340 - 349. What Are the Risks Associated With Shoulder Replacement Surgery? Could Your Shoulder Pain Actually Be Arthritis? Is Partial Knee Replacement Surgery Right for You?